Specific sensory elements can trigger specific emotions, memories & thoughts. The smell of home cooking, a specific object or even a song or sound can transport someone back in time. They can bring back vivid memories & produce specific emotions & thoughts. So why not blend various sensory elements in one room (or memory room), to produce stronger emotions & memories? This room would result in a truly immersive experience. This can involve a combination of customized sensory elements & existing ones. 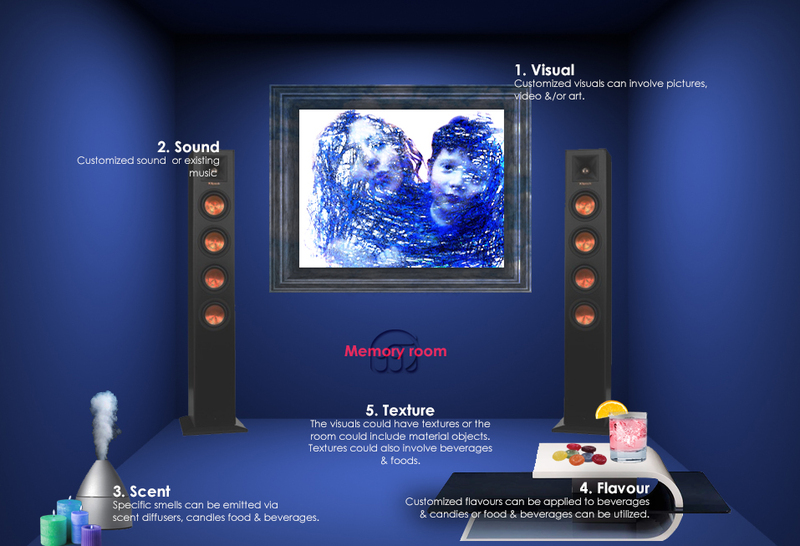 Visuals for memory rooms can be composed one main sensory component or a combination of pictures, art & video. Sounds can involve old audio/video, customized soundscapes or songs. Scent memories can be triggered via food/beverages (hot apple pie & coffee), incense, perfume or customized scents. For simplicity, the smell of various food/beverages can be formulated into a scent & spread into the air via a scent diffuser or candles. Similar to smell, food & beverages can be used as memory triggers. For more complex ideas, customized flavours can be applied to a variety of products such as hard candies or beverages. Textures able to trigger specific emotions & thoughts come from the art itself or from objects that are linked to the memories that want to be relived. Temperature, air flows & vibrations can also be utilized. If you’re walking down the street and you smell a scent, it can take you right back to a memorable time in your life, whether it’s a moment with an ex-girlfriend or a childhood event.